There are many ways to make coffee in the backcountry. A simple brew of cowboy coffee gets caffeine in your system just as well as a complicated contraption that creates a shot of backcountry espresso. The Jetboil Coffee Press lies more on the simplistic side of the spectrum and with it you can produce a great cup of coffee. But the question remains – is it the best method for your morning fix when you are in the woods? Well, that depends on what your commitment to coffee is. I’m a bit of a coffee snob. Being from Seattle I am surrounded by the best coffee the world can offer with a multitude of methods to turn it from bean to drink. I go out of my way during my daily buisness to drink good coffee and I think a cup of joe is an essential step in my morning routine. One thing most coffee enthusiasts agree on is that a French Press is one of the greatest methods to create a quality cup of coffee. 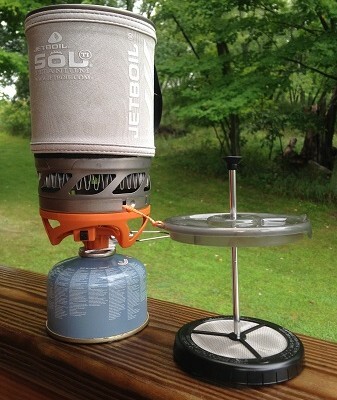 I won’t get into the details of why in this article but I will say that I can tell the difference between French Press coffee and coffee produced through other methods, so, from the get go the Jetboil Coffee Press starts with an advantage. After making a cup of coffee using my favourite grind of free trade organic beans I can say that the Jetboil Coffee Press doesn’t disappoint. It produces a very quality cup of coffee that is on par with any cup of French Press coffee ordered from the finest restaurants. Set up stove and boil 22 oz. of water. Poor 14 oz. of water into my mug and add two packets of Starbucks Via instant coffee, a dash of cinnamon and some sugar. Dump two packets of instant oatmeal, 4 tlbs. of chia seeds (chia seeds have 3g of protein/tlbs. – they fortify my oatmeal and add a little texture), a dash of cinimon, and some dehiderated fruit chunks into the remaining 8 oz. of water left in my Jetboil’s pot. With the above steps complete I can now drink my coffee while I wait for my oatmeal to cook. Remove the Jetboil’s lid and hook the press part of your Coffee Press up to it (you can’t boil your water with the press attached – if you do your water boils over and the heat of the metal can melt the plastic of the press). Dump your coffee grounds into the water and pop on your lid/press onto the top to retain heat and wait 3-5 minutes for your coffee to brew. Once brewed poor you coffee into your mug, clean out the Jetboil to remove the leftover coffee grounds, and detach the coffee press. Now you are finally ready to move on to making your breakfast. Turning your Jetboil into a French Press eliminates the ability to multi task during your breakfast routine. The first method makes both oatmeal and coffee while the second (the one using the Jetboil Coffee Press) just makes coffee and takes about twice as long and uses extra water (to clean out the pot). There is no denying it – the Jetboil Coffee Press is the best and simplest method I know of to make cafe quality coffee when you are miles away from a kitchen. But if you value speed in your morning backcountry routine sticking with either instant coffee or tea bag brewed coffee is probably the way to go. This entry was posted in Gear, Camp Kitchen, Accessories, Activities, Activities, Alpine Mountineering, Activities, Backpacking, Brands, Gear, Camp Kitchen, Activities, Car Camping, Activities, Fishing, Gear, Activities, Hiking, Brands, Jetboil, Product Review, Activities, Sea Kayaking, Activities, Ski Mountaineering.